The days of felling and splitting wood with an ax are long behind us. Nowadays, in the age of power tools, we've got plenty of more convenient ways to split up firewood. From felling to storage, we've got you covered with some great tips. So take the strain out of log splitting, and find the path to easy street with these incredibly helpful tools of the trade. Before you can split logs, you've got to have logs. So cutting down (felling) a tree is typically the first step. But in some cases, you may already have a tree that's fallen. Whether you're felling a tree or not, you'll need to cut that tree into log segments. Hand saws may work, but they'll also wear you out quicker than they'll get the job done. For more power and efficiency, you should consider a chainsaw. Chainsaws make it easy to cut trees into logs, and they'll leave you with enough energy to finish the job. However, don't just pick the one that looks tough. Choose a chainsaw that'll do the job you need it to do. Click the link below to visit the Chainsaw Buyer's Guide at ChainSawsDirect.com. Instead of fumbling with an old fashioned tape measure and chalk, use a firewood marker to accurately measure the distance between logs. Just insert a can of surveyor’s paint and roll it down the log. It will mark perfectly-measured cuts over, and over again. It'll save your back, and you won't get frustrated trying to measure consistently even segments of a tree with a ruler. Just click and roll to get quick marks with ease. Don't dull your chainsaw blade by cutting dirt. Laying a log on the ground and cutting through into the soil will have you going through chains as fast as you do work socks. Instead, just jack your logs off the ground with a log jack. 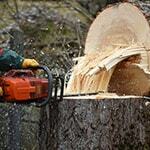 These are some of the most valued logging tools on the market today. They're heavy-duty and easy to use. 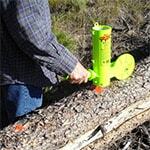 Some can also be used as a sawbuck, log roller, post/sapling puller and log carrier. Quality firewood needs to age like a fine cigar. As it sits by the fence post, the heat of the sun will bake the moisture out of it, and the wind will blow it away. Set aside your logs and let them breathe. It's a lot easier to move and split dry, seasoned logs than it is to split fresh "green" logs that are more dense. Besides, green wood isn't going to burn anyway. It'll just smoke a bunch and go out. Let it turn nice and dark, and wait for the edges to crack a bit. Once it's ready, it'll be lighter to carry, easier to split, and better to burn. That's a lot of positives for such little work. Now, it's time to start up that log splitter. Whether you're using a gas-powered log splitter or an electric log splitter, you're on the right track. 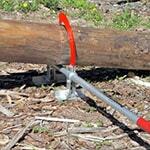 Log splitters save you a lot of shoulder and back pain caused by swinging an ax over, and over again. 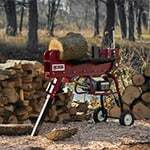 If you don't have one yet, our walk-through guide will help you pick the perfect log splitter for your wood pile. Just browse through and choose your own preferences to find the one that's right for you. Storing firewood isn't as easy as tossing it in a box and closing the lid. There are a few things you ought to know first. Just as you had to season your firewood to dry it out, you'll want to store it properly to keep it dry. That doesn't mean zip-locking it in a bag though, because you also don't want to trap any moisture against the wood. Protect your investment from insect infestations by keeping it neatly stacked off the ground with a firewood rack. And store it in a breezy place away from your home to keep vermin from sneaking in your back door. While a lot of people may stack firewood against the side of a garage or a barn, that's not necessarily the best way. 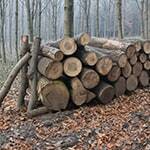 It's ideal to leave a gap behind the stack as well so air can access the wood from all sides. 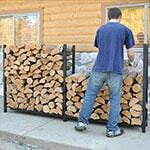 To lean the ins-and-outs of firewood storage, follow the link below.